“Elvis Presley’s Ghost is a satire book on Elvis impersonators, psychotherapy, the police and exercise fanatics.” That is a quote from the back cover of this book. I have to say I don’t read much satire. Maybe I don’t have enough experience with satire to really understand it, but I have to say I didn’t like this book. The humour in this story tried way too hard. Yes, some bits and parts were funny, but the whole story is way over the top. Elvis Presley’s ghost appears out of a record to a random, boring man in the UK. This strange happening leads Jamie (the boring guy) to become an Elvis impersonator, but with the “real” Elvis behind him. Then a very strange story unfolds with other impersonators, very strange police officers and other unnecessary plot points. The writing style in this novel is fine. The story flows (even though it’s a weird story!) and it’s easy to read. I saw very few errors of the spelling/grammar type, which made me happy. I will say it didn’t take me very long to read this book, but I did fall asleep many times while reading it at bedtime. This is not uncommon for me, but I can usually get through a few pages before that happens. Elvis Presley’s Ghost only held my attention for a page before my eyelids got too heavy. 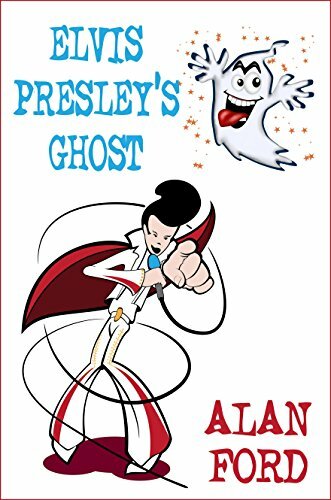 If you like satire and that sort of humour, Elvis Presley’s Ghost may be just the story for you. It wasn’t my cup of tea. There was too much going on, and every sentence was trying to make fun of something – or at least it felt that way. But I always appreciate being approached for book reviews – feel free to contact me if you’re an aspiring author and you’d like some exposure for your books! I know these indie authors are looking for good reviews, so I do my best. I appreciate your continued support Darlene!